I’ll be doing a half-hour talk at the October meeting of the electronic arts organization Dorkbot in Seattle on Wednesday October 3rd at 7:00pm. Come hear about the project’s art concept, hardware, and software with plenty of demonstration. If you’re in the Seattle area, I’d love to see you there! 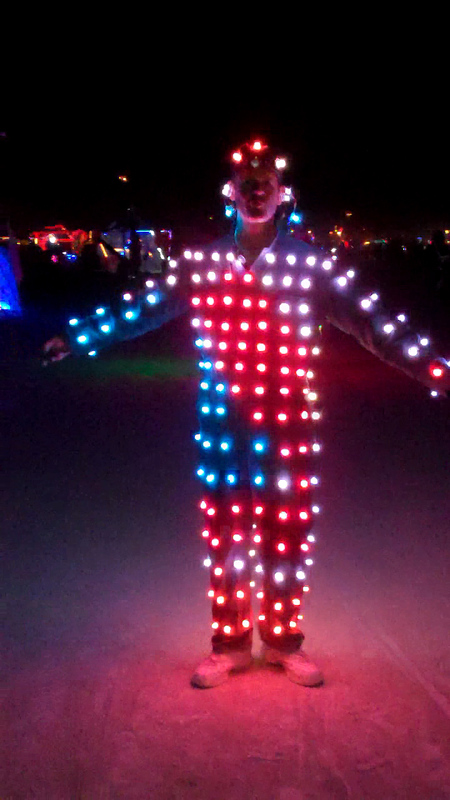 Categories: anthrolume 2.0 | Tags: Anthrolume, Burning Man, LED guy, LED suit | Permalink. LA Weekly had a ton of coverage of Burning Man, and sure enough a picture of myself and my fellow campmate Damon appeared in their piece The Fantastic People of Burning Man. Photo credit: Curious Josh, LA Weekly. Yesterday I added a feature to Animaker called “strip visualization.” Strip visualization is a compact representation that shows all the frames of an animation in a single image, where each LED’s color is represented by one pixel (with LED #1 on the left and LED #250 on the right), and each frame represented by one row of pixels. So if there are 384 frames in the animation, the strip image will be 250×384. 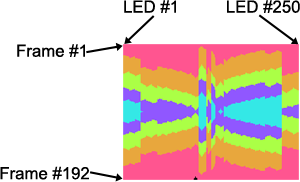 The surprising part was just how interesting the strip visualizations turned out to be. For my animations that are sourced from famous abstract paintings, the strip images are effectively a machine-generated reinterpretation of the source artwork. There several factors that affect what exactly appears in the strip animation: The source imagery, the animation or animation path over the source, the exactly placement of the LEDs (which governs which points of the animation frame are sampled), and the order of the LEDs in the suit. The latter factor, LED order, causes the “V” shapes that are seen in the strip images. Because the LEDs are in a single long strand, they take a serpentine path through the suit. Here’s a sampling of interesting strip visualizations sourced from a number of my animations, some based on abstract greats, and other simpler ones based on my own work. 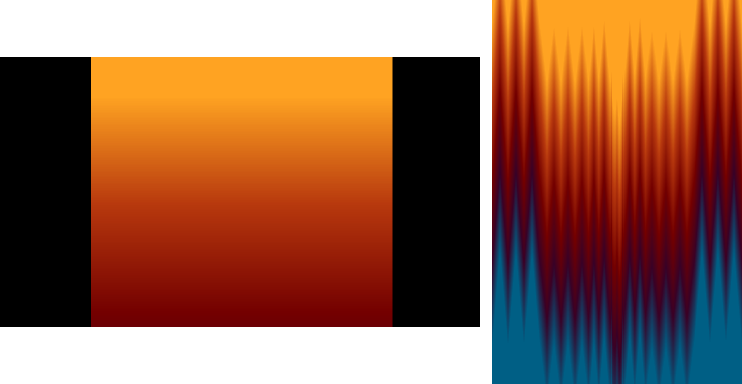 For each pair, the image on the left is a single representative frame from the my source Flash animation, and the image on the right is the strip visualization. (There are more on Flickr.) I hope you enjoy this accidental art as much as I do. It’s cold in the high desert at night! Design the suit for cold weather. Get as many chargers as you have batteries. The good news is that on most fronts, Anthrolume 2.0 really was a spectactularly more successful piece than the 1.0 suit. All of the above except (3) were well addressed. The new suit was hug-friendly and I was glad for that – I can’t count how many serious bear-hugs I got. The overalls were warm because I could wear whatever I wanted underneath. And I had 12 batteries and 12 chargers – parallel charging is great! Cable stresses, however, did continue to dog me this year. In fact, it was worse than last year. So the revised lesson is: if you’re going to create wearable art, wear it! The reason I didn’t discover my cable stress points was because the suit spent a lot of time hanging from a microphone stand on a hanger, instead of on my body. Lesson learned. 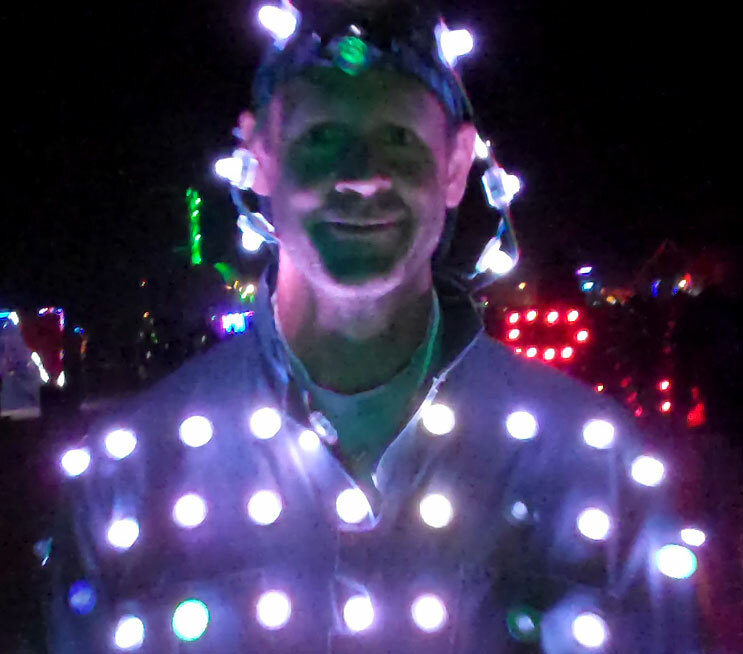 I ended up field-replacing four LEDs while I was at the Burn. But after that, the suit worked like a champ, including the abuse I put it through getting up onto the scaffolding at the 2:00 rave and two hours of straight dancing that night. Also the 12 batteries performed well – 6-7 hours of continuous animation playback. Of course I wished for more – next year I’ll bring extra batteries. I also learned more about which animations work and which don’t. Since my suit is really just an animation-playback platform, I’ll take that wisdom forward to improve how the suit looks in the future. CoolNeon LEDs are mostly playa proof. Having pockets in the suit was great. I had to add special wiring extensions for that, and boy am I glad I did. The cut-washer method of attaching the LEDs worked great – not a single washer came off the entire Burn. I’m still working on Animaker. More to report soon. Anthrolume 2.0 made its successful debut at Burning Man 2012. I’ll let the video do the talking.